These purple PSA sanding discs are the product of 15 years of ongoing development. When tested by professional woodturners the results were decisive. "The more I used the Ceramic Discs the more I liked them" was the reaction we received. Since they will do about 5 times more work than standard Aluminum Oxide discs the price of the ceramic discs is more than justified. PSA stands for pressure sensitive adhesives, also known as " sticky back". They have a paper backing that exposes the adhesive when removed. PSA holder are available under Holders and Extensions. Not intended for use with Hook & Loop Holders. The patented Cubitron™ ceramic grit used in making these discs fractures to expose fresh cutting edges to the work surface, meaning longer life and a more consistent finish quality. The Ceramic discs are treated with Xodust™ to control loading with sawdust. Rather than putting a coating on the top like most discs, they are treated all the way through the grit, keeping them from clogging and greatly increasing the life of each disc. 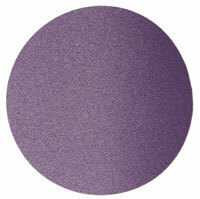 These purple discs have a J Weight cloth backing material for excellent flexibility and long life. We offer the PSA Ceramic Discs in 2", 3", 5" dia.